Length Model Miss Maudy 1.70m she is wearing a size 10. Fabric contains no stretch, top is lined. Limited collection! 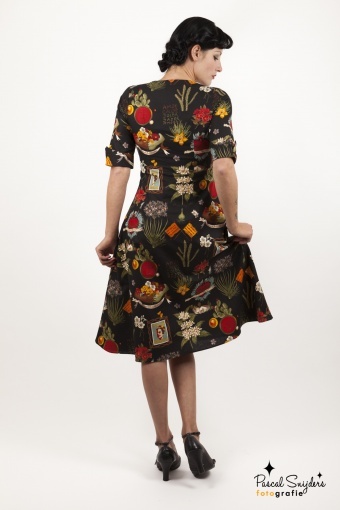 40s handmade Viva Frida Black half sleeve dress. 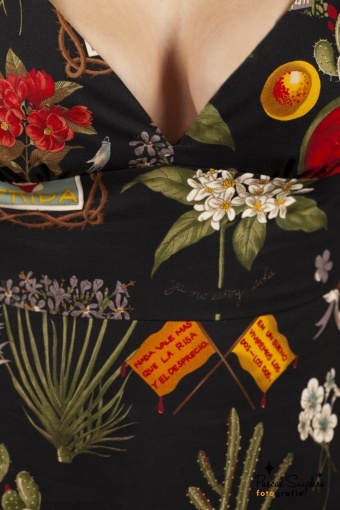 Handmade beautiful vintage inspired half sleeve dress in cool ‘Frida Kahlo' printed quality cotton with an elegant sweetheart neckline (lined top), half height sleeves with a turned cuff, slim fitted waistband and a concealed side zip fastening. It als features a full A-line skirt and sits below the knee to calf height. This dress is made from a vintage block and is available in different cupsizes for a perfect fit! Look stunning in this fabulous dress.